The Suns finish 7point winners, recording two victories from their two JLT Community Series games. The Suns won contested possessions 180-165 and despite trailing inside 50s 60-48, converted their chances far better than the Lions. Accuracy has been the story of the day for the Lions. 1.12 (18) from shots at goal from general play has hurt their chances, while they have recorded 1.4 (10) from shots inside 30 metres. In comparison, the Suns have scored 5.1 (31) from this distance. Jarryd Lyons has had a stellar game for the Gold Coast Suns. He has a gamehigh 32 disposals (17 contested possessions), six clearances, ten inside 50 entries, four score involvements and a game-high 657 metres gained for his team. Darcy Macpherson takes the Suns first contested mark inside their forward 50 for the game, and then kicks the goal. Macpherson played eight matches for Gold Coast in 2017, averaging 11.8 disposals and 3.1 tackles per game. Aaron Hall kicks a clever goal off the ground and gives the Suns an eight point lead. Hall is having a productive final quarter with a teamhigh six disposals (four contested possessions), 106 metres gained and a game-high two shots at goal this quarter. Dayne Zorko is coming off an excellent season in 2017, where he led the Lions in total disposals, tackles and goals. He has had a very good game today with a gamehigh 28 disposals (15 contested possessions), six tackles and five clearances. The Lions are continuing to bridge the contested possession gap, leading this statistic 1812 in the final quarter. This has led to a clearance lead of 6-2 and a resultant three shots on goal for the Lions, however all have resulted in behinds. Gold Coast Suns InterchangeJesse Joyce replaces Pearce Hanley and is possibly out for the game. In saving a goal, Pearce Hanley appears to have dislocated a shoulder. The Suns will be hoping the injury is minor, after Hanley averaged 19.6 disposals per game in his first season at the Gold Coast, including 3.3 rebound 50s per game. In his first game in Brisbane Lions colours, Luke Hodge has had a solid outing. From 78 percent time on ground, Hodge has collected 15 disposals (four contested possessions) and recorded a disposal efficiency rate of 87 percent. The Suns hold a 5point lead at three quarter time. The Lions dominated that quarter, leading disposals 105-76, contested possessions 52-40, uncontested possessions 51-29 and inside 50s 22-8. They were wasteful in front of goal, recording 1.7 (13). Daniel Rich has found plenty of the ball in this third quarter with eight disposals, including four intercept possessions. He has also sent the Lions inside 50 on two occasions and had two score involvements. A snap on goal from Cameron Rayner misses to the left. The Lions have now recorded 0.8 (8) from kicks on goal from general play, including 0.6 (6) from snap shots. After a strong game in the first preseason match for the Lions, Stefan Martin is continuing his good form. To this point in the match, Martin has 16 disposals, six clearances and 19 hitouts, including four to advantage. Tom Lynch kicks his first goal for the Suns, very much against the run of play. Lynch kicked 44 goals for Gold Coast last season, at an average of 2.3 goals per game. Lynch also averaged a careerhigh 1.4 score assists per game in the 2017 season. The Lions have started this third quarter strongly, leading contested possesions 95, inside 50s 5-1, while the ball has spent 72 percent of the time inside the Lions forward half. An 11point lead for the Suns at half time, built off their dominance in contested possessions, which they lead 103-76. Jarryd Lyons has had a good first half with 17 disposals (nine contested possessions), three clearances and six inside 50 entries. 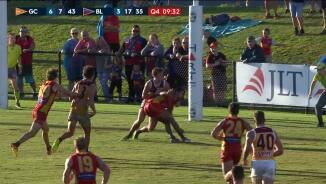 Some undisciplined play from Gold Coast, giving away two 50 metre penalties in the space of five minutes. 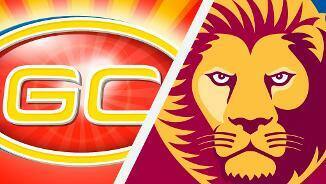 This time Jarrod Berry makes the Suns pay, kicking his first goal of the game for the Lions. Berry has had eight disposals so far in the match. Lewis Taylor kicks the Lions first goal of the game after a mark inside 50. Brisbane lead marks inside the forward50 zone 4-1 so far. Brisbane ranked last in the AFL in 2017 for contested possessions and that trend is continuing today, trailing Gold Coast in contested possessions 8354 in these wet conditions. Ryan Lester was quiet in the first preseason game for the Lions, but he is having a good first half today. To this point he has a team-high 12 disposals (including a team-high seven contested possessions), two clearances and two score involvements. Ben Ainsworth kicks his first goal for the game and the Suns second for the quarter. The Suns started the first quarter with four consecutive inside 50 entries and have done it again in this second quarter, leading inside 50s 40 and 18-15 overall. After two consecutive shots at goal for the Suns from freekicks, Touk Miller makes his shot count for a goal. Miller has had a game-high five tackles to this point in the match and averages 4.8 tackles per game over his career. The Suns record an 8point lead at quarter time in very wet, tough conditions. It has been difficult to use the ball efficiently by foot so far, with both Gold Coast and Brisbane recording kicking efficiency rates of less than 50 percent. Alex Sexton for the Suns registers the first goal of the game after a long wait. Sexton played a careerhigh 20 games in 2017 for the Suns, kicking 12 goals. Sexton registered 67.2 percent of his disposals in the midfield in the 2017 season. Despite trailing contested possessions 4233, Brisbane are making up for it with their tackling intent. The Lions currently lead the tackle count 20-13, with six players having recorded two or more tackles, compared to just two players for the Suns. After 22 disposals in the first game of the JLT Community Series for the Suns, Jarryd Lyons has had an excellent start to this game too. To this point, he has seven disposals (three contested possessions), 126 metres gained and three inside 50s. In very trying conditions, Luke Hodge has already set the standard in the defensive half for the Lions. He has a teamhigh four disposals, including two intercept possessions to this point. Gold Coast are playing the wet conditions well so far, leading the contested possession count 189, leading to a clearance lead of 4-1. The Gold Coast Suns have dominated the early proceedings, registering the first four inside 50 entries for the game. Three of those entries have been courtesy of Jarryd Lyons. Today's clash features the bottom two ranked tackling teams from the 2017 season. Gold Coast ranked last in the AFL last season, averaging 61.6 tackles per game, while Brisbane averaged 62.1 tackles per game, ranked 17th. Brisbane fans will be looking forward to seeing Luke Hodge in Lions colours for the first time today. Hodge has averaged 19.4 disposals from an average of 80 minutes on ground in the preseason across his career. Last time these two teams met, Brisbane ran out 58 point winners in Round 21 last season. Overall, Brisbane lead 95 in the previous meetings between the two teams. Welcome to Fankhauser Reserve for the Gold Coast Suns v Brisbane Lions Round 2 clash. 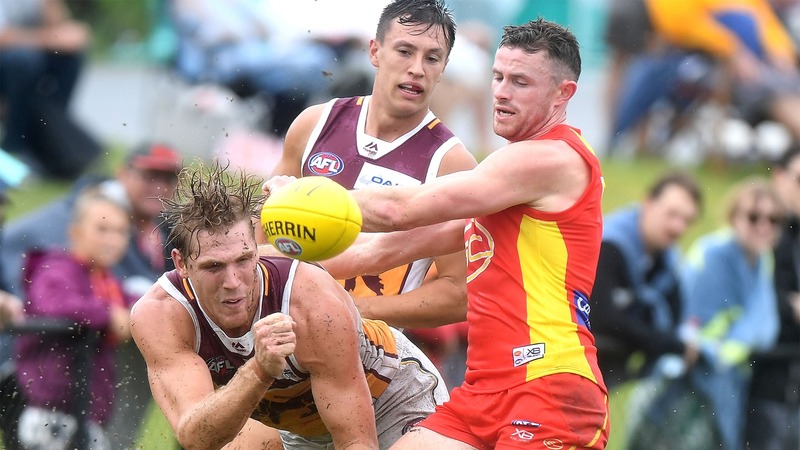 GOLD Coast has completed a perfect pre-season with a grinding seven-point win over Brisbane at Southport but will be sweating on the results of a shoulder injury to Pearce Hanley. 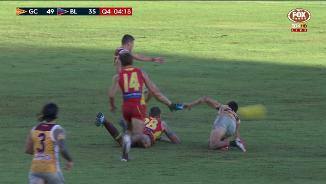 Hanley dived to touch a ball right on his defensive goal-line early in the final quarter but slid towards the fence and appeared to dislocate his shoulder. The running half-back had it popped back in before leaving the field in severe discomfort. The injury slightly soured a 7.7 (49) to 4.18 (42) victory at a water-logged Fankhauser Reserve in a contest that was marred by plenty of rain. It was the Suns' second-straight win of the JLT Community Series after they easily accounted for Geelong in Townsville seven days earlier. 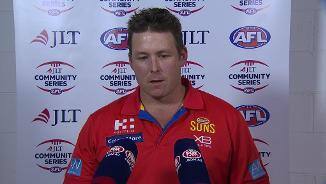 "It was a slog," Gold Coast coach Stuart Dew said. "We've had a fair bit of rain the last few weeks so we were prepared for it. "It was good for our boys to grind away. "We won contested ball, ground balls and tackles, things we were working on. It was pleasing." After jumping to a 23-point lead early in the second quarter, Gold Coast had to withstand plenty of pressure from an inaccurate Lions outfit. It was hard to assess much from either team, so difficult were the conditions, but the attack on the ball from both was fierce and created a good contest. 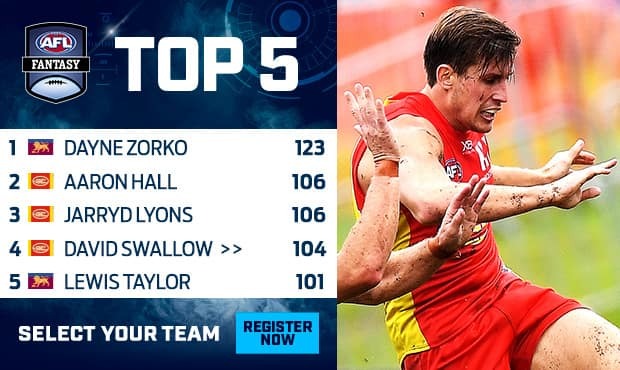 Goals by Aaron Hall and Darcy Macpherson in the fourth quarter appeared to give the Suns a match-winning lead, but Dayne Zorko kept the visitors in it with a soccered goal from 25m. The Lions had more scoring shots (22-14), more inside 50s (60-48), and more disposals (381-345), but could not capitalise. 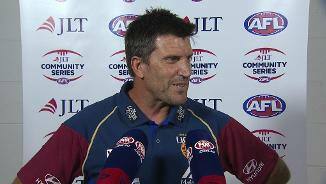 Stand-in Lions coach Dale Tapping said there was plenty to like despite the loss. "Our commitment and effort at the contest was terrific," he said. "Sixty inside 50s in those conditions was pleasing. "There's even aspects of our ball movement that got rolling, particularly from the defensive part of the ground after half-time, so there was some little wins for us in the game." Jarryd Lyons (33 disposals), David Swallow (25) and Aaron Hall (23) worked hard in the midfield, while Jarrod Witts offered plenty around the ground. For the Lions, Zorko was terrific in his first game, finishing with 33 possessions, while youngster Jarrod Berry (15 and one goal) was clean in the tough weather. Gold Coast dominated much of the first quarter, kicking the only two goals courtesy of Alex Sexton and Port Adelaide recruit Aaron Young. 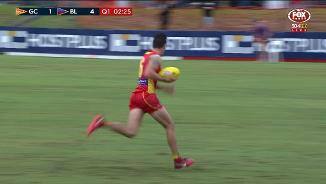 Sexton's goal came after Tom Lynch out-bodied Dan McStay on the wing, picked up the loose ball and kicked it into Sexton's path who ran into an open goal. Lynch had a solid game, but his high bump on Mitch Robinson in the third quarter may attract match review scrutiny this week. After the Suns bolted to a big lead early in the second term, the Lions fought back, able to clear the congestion and get their outside run happening. 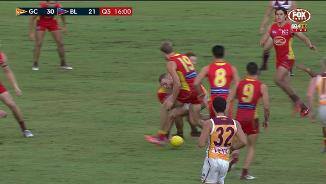 Lewy Taylor kicked a goal after a fortuitous pass from Nick Robertson and when Jarrod Berry converted from close range after Aaron Hall gave away a 50m penalty, Brisbane was back in it. Gold Coast: With a few spots in the Suns' round one team still up for grabs, Will Brodie put his hand high in the air with a strong showing. Brodie, who played just three games in his debut season, finished with 18 disposals, 10 of them contested. The 19-year-old is strong and loves the wet conditions, and with the opening match in Cairns – often wet and slippery at this time of year – Brodie will come right into the frame. Brisbane: Luke Hodge will deliver everything the Lions hoped for when they signed the Hawthorn champion. Hodge got through his first match strongly and looked as composed and clean as any player on the field. He often sat off his opponent and directed his backline teammates into position. Brisbane looked far more organised defensively than it did last week against Sydney. Gold Coast: After a quiet week against Geelong, Lachie Weller showed a few glimpses of his enormous talent. The former Freo midfielder finished with 20 disposals, but most impressively he ran at 60 per cent efficiency, which was exceptional in the conditions. Nick Holman moved a step closer to a round one appearance with his second-straight excellent showing. Holman had 13 disposals and five tackles, helping to lead the Suns' forward pressure again. Aaron Young showed some glimpses of his class, kicking a brilliant first-quarter goal after snapping truly with the left boot from deep in the right forward pocket. Brisbane: In his first game for the club, Luke Hodge was terrific. Playing in defence, the former Hawk racked up 16 disposals and organized the Lions' defence. No.1 draft pick Cam Rayner took a big step forward after his quiet debut last week. He had 13 touches, missing two shots at goal, and his nine tackles added plenty of value. Former Crow Charlie Cameron didn't get many chances and will be itching to get a run on a dry surface. Gold Coast starts its 10-week road trip in round one with a match against North Melbourne in Cairns. The contest presents the Suns with a great chance to get their season off on the right foot. The Lions will travel to Melbourne to play St Kilda at Etihad Stadium in the opening round in Luke Hodge's first premiership game for the club.